In a perfect world, working out would be one of the highlights of the day. You’re far away from the responsibilities of work, you’re getting your heart rate up, and you’re boosting your happy hormones like endorphins. In the best case scenario, a workout is an all-around mood booster. 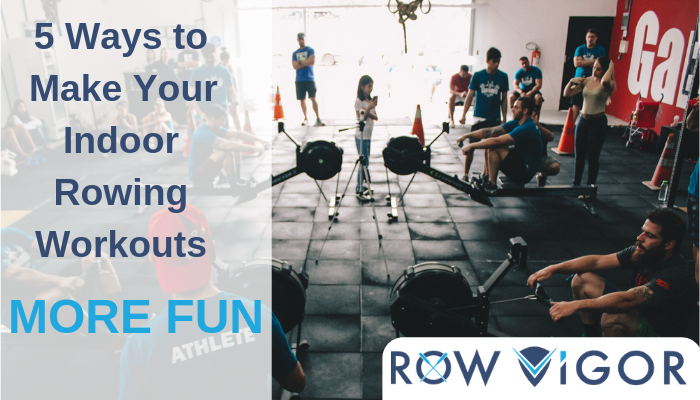 And low-impact, full-body exercises like indoor rowing are definitely the cream of the crop. Alternate 30 seconds of resting and sprinting until you’ve worked out for 7 minutes. In addition to breaking up the routine, this type of “high intensity” training has a range of surprising benefits. It can help you build endurance, burn more fat in less time, and even boost your metabolism. In addition to toning you up, improving balance, and improving breathing, yoga is great for your mood. Research has shown that even a quick yoga practice can decrease your stress levels and increase your overall well-being. PRO TIP: Check out the ROWga class in the ROW ViGOR app! Work your core and center your mind by incorporating pilates into your workout. Challenge yourself with kettlebells which help to build up strength and stability with minimal equipment. PRO TIP: Check out the Kettle Row class in the ROW ViGOR app! Resistance band workouts are great for strength training. In a pinch, you can even use a resistance band to simulate rowing! PRO TIP: Check out the Bands Bands Bands class in the ROW ViGOR app! Need some extra motivation? Nothing motivates like falling behind a friend! Exercising with others can make all the difference — especially when you think your partner is a higher-performing athlete than you are. In a Kansas State University study, people were matched with partners whom they perceived to be “better” at the exercise in question, and as a result wound up increasing their stamina and intensity by up to 200%! Sometimes, all we need is a motivating force to put out our best, most intense workout. Studies aside, many of us know from first-hand experience that having a workout buddy helps push us to be more accountable and motivated to go to the gym. When you work out with friends, it’s no longer a chore — it’s a fun social activity that allows you to chat, bond, and even get a little competitive. So if you feel like you need to amp up your workouts, invite a like-minded buddy to row with you. And keep in mind that you don’t necessarily need an in-person gym buddy. You can use a rowing app, like ROW ViGOR, to challenge friends from afar. Did you know that listening to music while exercising can actually improve your stamina and improve your mood as well? If you’ve been going into your workouts with nothing to distract yourself, it’s time to get creative about your entertainment options. Obviously, music is a great idea. You can even modulate the type of music you’re lining up. In the mood for a long workout? Line up some slow-and-steady tunes. Aiming for a more intense workout? Try incorporating high-energy music into your routine. Music is great (and may be the best choice for some), but sometimes you just want to be part of a group. Taking the classes on the ROW ViGOR app will help to make the workout more fun and entertaining! Try it out in place of music, we bet you’ll love it. Indoor rowing is an incredible full-body sport. It’s an excellent aerobic workout that helps balance your body fat, promotes weight loss, gets your cardiovascular system working hard — all without causing unnecessary stress to your joints. While all of this is true, it’s important to remember that everyone’s fitness goals are completely unique. To keep yourself motivated, you need to have clear goals outlined that you can work towards while rowing. Are you exercising to stay healthy and fit? Are you working out with a marathon in mind? Do you have a rowing competition coming up? Are you tracking progress alongside a friend? It’s important to keep challenging yourself with your fitness routine. Not only does this ensure you’re getting the best workout possible, it also makes exercise more fun and rewarding. If you’re having difficulty deciding on fitness goals, it might help to keep a fitness journal. For others, staying accountable to a gym buddy can be a huge help. For a lot of us, our favorite apps help us get through the day feeling happy and successful. They keep us motivated, on task, in the know, and of course, connected with our friends and family. Why should your workout app be any different? Switching up your workout, challenging friends, setting goals, and staying entertained is all part of daily life with the ROW ViGOR app. ROW ViGOR can help you stay motivated, have fun, and reach those New Year’s Resolutions! Step up your game with live rowing classes and on-demand workouts that challenge you in new ways. Stay inspired and fight off boredom by syncing your workout with a digital rowing journey down a famous river. And if you have a competitive edge, our app helps you track your fitness progress and beat your own score — or challenge your friends. If you’re feeling like your workouts could use some pizzazz, there are tons of options for keeping it fun and fresh. To take your workouts to the next level, download the ROW ViGOR’s app and get rowing! And remember to always make them RESPECT YOUR ViGOR!